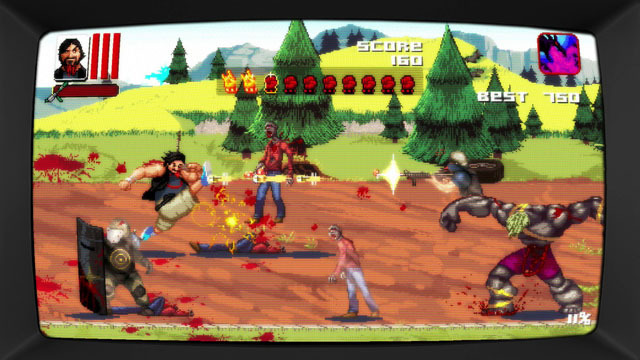 As a way to promote Dead Island Definitive Edition, the publishers have employed Empty Clip Studios (developers of Symphony) to develop a 2D belt scrolling beat-em-up set in the Dead Island universe, starring a guy on a mission to rescue his cat during the zombie apocalypse. The faux arcade actioner offers fist smashing, bullet spraying, and flame throwing across a 3-lane auto-scrolling environment with a guy who's trying so hard to be Jack Black it's (literally) not funny, as introduced in the obnoxious trailer below. The game is set to defile PS4 and Xbox One on August 1, and it's already on PC via Steam.